(MENAFN - Jordan Times) AMMAN — Jordan has ranked third as the best investment environment in the field of renewable energy, according to the Bloomberg's Climatescope 2018 Index, Minister of Energy and Mineral Resources Hala Zawati said. The index announced Jordan, among 103 countries, taking the third slot after Chile and India, in attracting investments into its renewable energy sector, she said. Climatescope is a country-by-country assessment, interactive report and index that evaluates the investment conditions for clean energy in emerging markets. It profiles markets worldwide and evaluates their ability to attract capital for low-carbon energy sources while building a greener economy, according to its website. The Kingdom is recognised as one of the pioneering countries in shifting to renewable energy, 'thanks to the country's policies and regulations along with the direct offers that the Kingdom has provided, which have led to the flow of mega investment projects in this field', the minister said. 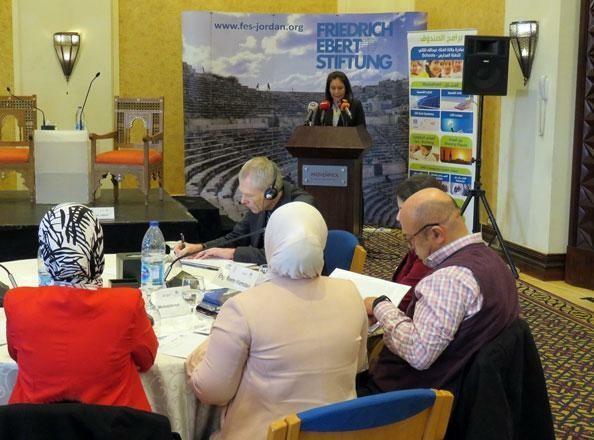 Her remarks came during the 'Renewable Energy Transitions in Jordan' conference inaugurated on Tuesday, organised by the Friedrich Ebert Stiftung (FES), in cooperation with the Jordan Renewable Energy and Energy Efficiency Fund (JREEEF), affiliated with the ministry. Jordan started its renewable energy journey in 2008, and after enacting the Renewable Energy Law seven years ago, the contribution of renewable energy to the energy mix has reached 10 per cent and is expected to increase to 20 per cent by 2020, Zawati added. The minister highlighted that the Kingdom has qualified individuals in the field who compete and work in different Arab countries, noting that several countries seek to adopt Jordan's plans and relevant legislation in this regard. JREEEF's director, Rasmi Hamzeh, said in his remarks that the renewable energy sector provides stable jobs, while international reports offer proof that Jordan has achieved advancements in this field in spite of the challenges facing it. FES Regional Coordinator Franziska Wehinger said that the Kingdom, in cooperation with the JREEEF, has managed to increasingly rely on renewable energy, and that the current challenge is to funnel that power into the electricity grid, the Jordan News Agency, Petra, reported. The participants in the two-day conference will discuss the institutional challenges and technological needs to achieve successful transitions to renewable.